Reverse cut-off over-ride doesn’t default to safety cut-off mode. The clutch takes up very sharply (which is tricky if you often reverse and then go forwards). Seat isn’t easily adjusted for leg room. 08 Apr 2018, Megan S.
Have had for 12 years. Bought 2nd hand and not had many issues apart from changing belts now and then. Not a very good lock. Grass can get caught in the belt. 16 Oct 2015, Rebecca D.
The price, reliable start up even after winter months in the garage. We bought the trailer that came with it and that has been very useful at times. The drive belt has been replaced so many times and if not replaced then it keeps slipping off the pulleys. 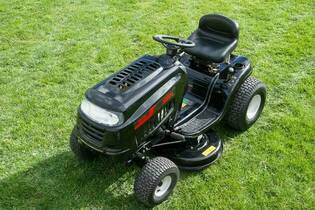 Would not buy again and this mower is the reason that I joined consumer as I am fed up and want to upgrade!